The majority of pets around the world used to be fed with commercial dry or canned petfood, and the owners of such pets believe that this is the only right way to feed their cats or dogs. At the same time, many owners prepare natural homemade meals for their pets. Why they do so? Some pets have special nutrition needs and simply can not eat commercial foods. 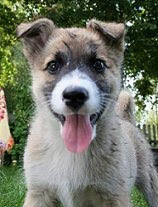 In other cases, owners have a tend to cook own meals and be sure that their pets are supplied with high quality foods. There are 3 most common types of dog diets. The first one is providing your dog with balanced homemade special foods rich with proteins and fats. The second one is a combination of high quality homemade foods with high quality commercial dry and canned foods. And, finally, the third type of diet is feeding the dog with the meals that is cooked for the whole family. If you want to make your dog eat only homemade foods, it is necessary to keep in mind some very important issues. First off, remember that cooking for your dog takes time and efforts, as well as takes certain additional expenses. Second off, you need to remember that dog's diet should be balanced and rich with certain nutrients and minerals. Sometimes it makes sense to add special supplements of additives to your homemade dog food. If the diet of your dog is not balanced, it may harm your animals. Besides, you should keep in mind that homemade foods are usually soft and can not provide your dog with enough of chewing that is essential for normal development of the teeth and cums. IN addition, when your dog gets used to homemade meals, it will be very hard for you to make him start eating dry food again. Therefore, combining soft balanced homemade meals with high quality canned or dry commercial foods can be the best solution. This way your cannie will always receive all necessary amounts of vitamins, minerals and nutrients, and be a healthy and happy dog!